(Nanowerk News) There have been impressive advances in computational methods, allowing researchers to better understand biological and physiological systems at the atomic level. In its latest Perspectives in General Physiology series, the Journal of General Physiology (JGP) offers an in-depth look at several of these methods and the advantages of each as applied to membrane proteins, with special focus on ion channels. The Perspectives appear in the June issue (www.jgp.org). 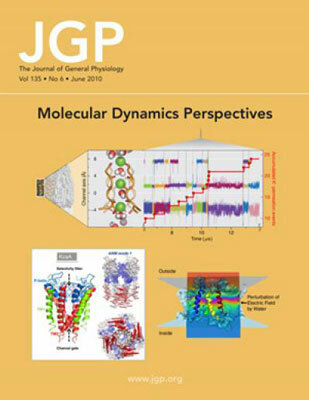 The June cover of the Journal of General Physiology includes a composite of figures from the Perspectives on molecular dynamics and computational methods. (Top) All-atom simulation of single-channel currents through Kv1.2 (Dror et al.). (Bottom left) Two symmetric modes of the prokaryotic potassium channel KcsA (Behar). (Lower right) Energy landscape calculated in simulation of state transitions of KCNQ1 (Silva and Rudy). The main focus of computational biology is to develop mathematical modeling and computational techniques to better analyze biological systems. As guest editor Benoit Roux (University of Chicago) explains, no single method can provide researchers with all the levels of description needed to fully examine every relevant lengthscale and timescale of a particular physiological process. However, the four Perspectives presented in this issue illustrate how various methods can be used to achieve different goals. The Perspectives include: Denis Bucher and Ursula Rothlisberger (Ecole Polytechnique Fédérale de Lausanne) present ab initio (first-principles) simulations; David Shaw and colleagues (Columbia University) examine the all-atom molecular dynamics (MD) method; Ivet Bahar (University of Pittsburgh) shows how important insights can be obtained from "course-grained" (CG) models; and Jonathan Silva and Yoram Rudy (University of Chicago) examine a strategy using a small number of simplified "states" to represent a complex system. The purpose of the Perspectives in General Physiology series is to provide an ongoing forum where scientific questions or controversies can be discussed by experts in an open manner.